1 Place the water and Knorr Stock Cube in a saucepan and bring to the boil. Add the rice, stir once, and return to the boil, then turn the heat down and follow cooking times on pack. 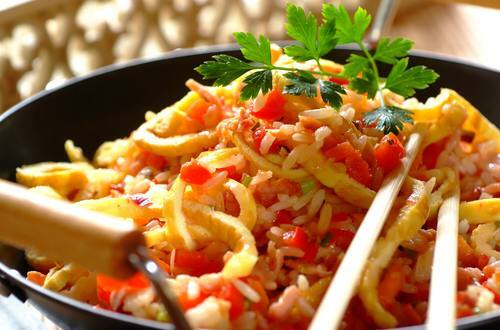 2 Heat half the oil in a wok and stir-fry the red pepper for 3–4 minutes. Now add the garlic, spring onions and Chinese five-spice and stir-fry for 2 minutes. 3 Beat the eggs. In a separate non-stick pan, heat up the rest of the oil and pour in the egg mixture to make a thin omelette; stir for the first minute then leave to set. Flip it over for 1 minute, then remove from the pan and cut into thin slices. 4 Add the cooked rice to the wok with the vegetables, stir, then add the omelette, and serve.